Zora Festival 2013! This year the festival theme says it all – “Zora’s Eatonville: Culture as Conservator of the Community’s Heritage” . It is an outstanding line up of education programs, information about the roots of Eatonville, Haitian Art Stroll, outdoor festival of the arts, food trucks and MORE! Starting Saturday, January 26 and ending Sunday, February 3, this event Zora Festival 2013 will attract those from near and far…even Russia! Thurston House, a north Orlando Bed & Breakfast, is proud to be just a short stroll up the road from this vibrant small community, the nation’s oldest incorporated African American municipality. The Town of Eatonville is proudly sponsoring another festival in honor of Zora Neale Hurston. This yearly event is packed with all sorts of lectures, school class events and museum displays. The end to it all will be this weekend when a street festival closes Kennedy Blvd. to traffic. All sorts of merchandise such as art, clothing and food will be for sale, and a variety of music will be heard all day. The weather is supposed to be beautiful so take advantage of this long planned event. 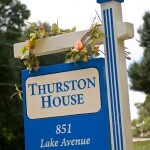 Thurston House bed & breakfast is just a few minutes down the street in Maitland! Stay with us, enjoy the festival, stroll around Maitland, head in to Winter Park….so much to do here! We have a very active Maitland Historical Society and they are always offering wonderful exhibits and lectures. I just attended a very interesting lecture and viewed a documentary about the historic town of Goldsboro. It is an African American community that is part of Sanford, just to the north of us. This documentary was done by Valada Flewellen, VP of the Sanford Historical Society and University of Central Florida students involved in the Zora Neale Hurston Institute for Documentary Studies College of Arts & Humanities. Zora Neale Hurston had a very strong link with my area, especially Eatonville, and also the area of Goldsboro and Sanford. All very interesting connections! The 20th (can you believe it!) Zora Neale Hurston Festival starts this week. There will be all sorts of events, and the end is a street party festival along Kennedy Blvd. this next weekend. My guests are very excited about walking down the street to go to it…only 1/2 mile from Thurston House. It should be fabulous! Eatonville dressed for the holidays! Eatonville, the oldest incorporated African American municipality (1887) in the US, is just down the street from us. We often head down their main street on our morning walks. This shot was taken last week. The beautiful brick sidewalks and many street lights glow with holiday decorations. Come stay at Thurston House bed & breakfast and take a stroll back in time. Eatonville, a small town just to our west, is the oldest Incorporated African American Municipality in the United States. It was home to the writer Zora Neale Hurston for many years. Her books were often based on her experiences here. Maitland was even mentioned in the book Their Eyes Were Watching God, made into a movie by Oprah Winfrey and starring Halle Berry. There is a museum open to the public all year round, and a self guided historic walking tour. Stay at Thurston House in January to attend the yearly festival held in Zora’s honor. The weekend street festival ends the festivities, and is only a short walk down the street.